A puppy had to have emergency surgery after eating an entire alphabet of fridge magnets. Six-month old Jack had just returned home from a castration operation on Thursday when he swallowed the magnets. 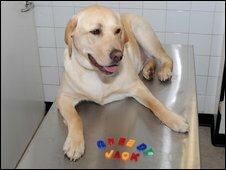 The yellow labrador was taken to the PDSA's charity hospital in Plymouth, Devon, by his owner the next morning, where he was immediately operated on. Owner Emma Keers says she will not buy any more magnets - and has banished Jack to sleep away from the fridge. 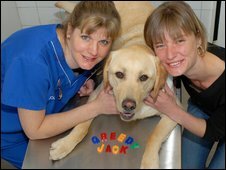 She said, "Jack was sleepy after the (castration) anaesthetic so I put him in the kitchen to recover overnight. "The next morning I noticed the whole alphabet was missing from the fridge, though Jack wasn't showing any signs of being ill.
"He can be quite greedy though." Vet Robert Newcombe said about 30 pieces of chewed plastic were found in Jack. "We had to operate straight away with both a gastrotomy, where we opened up his tummy, and an enterotomy, to remove more pieces of fridge magnets that had made their way to his intestine. "The letters were well chewed and not easy to identify."